As a part of the Falmouth Moraine Trail that extends from Route 151 in North Falmouth to Grews Pond, the Collins Woodlot and abutting parcels, 130 acres in all, offer a variety of features. The scenic pine bowl kettle hole is just one example of glacial topography. The maze of trails often follows the ridges, providing views of the treetops and even Buzzards Bay. Most of the trails are lined with trailing arbutus, or mayflower, which is the state flower, and teaberry or wintergreen. The Collins Woodlot was part of the first omnibus land package put together by The 300 Committee for town approval in 1986. Although there is no trace of it today, a nine-hole golf course was created there in the late 1920s and closed in 1938. George Collins, a long-time summer resident of West Falmouth, who bought the land in 1961 and sold the 49 acres to the town, was one of the managers of the course. He later became a professor of archaeology and art history at Columbia University. The town added a key piece of a pathway in this section of the moraine with the purchase of 47.7 acres from Blair and Georgene Scanlon. This parcel is north of Collins. There are three other conservation parcels in this area. The 300 Committee purchased 14.8 acres from John Lewis in 1992, abutting the Collins Woodlot on the east side. Two properties were acquired in the early 1900s for a fire tower. The 16-acre state property is identified on early plans as the Perry lot; the fire tower is on town land, 3.4 acres abutting the state land. The Falmouth fire tower was built in 1914 and is still used today, one of a network of observation towers established by the state to quicken the response to forest fires. The tower is under the state Department of Conservation and Recreation, District 1 Forest Fire Control, headquartered at Shawme-Crowell State Forest in Sandwich. The Cape look-out towers are staffed sporadically from mid-March through mid-October, especially in dry, windy conditions when the fire risk is highest. The trails are off Service Road, on the north side of Brick Kiln Road. Approximately ½ mile up the hill on Service Road, a dirt turnout has room for two or three cars. There are two trailheads: one at the large conservation land sign at the dirt turnout, and another, just a few hundred yards north, where small white arrows are painted on the road. 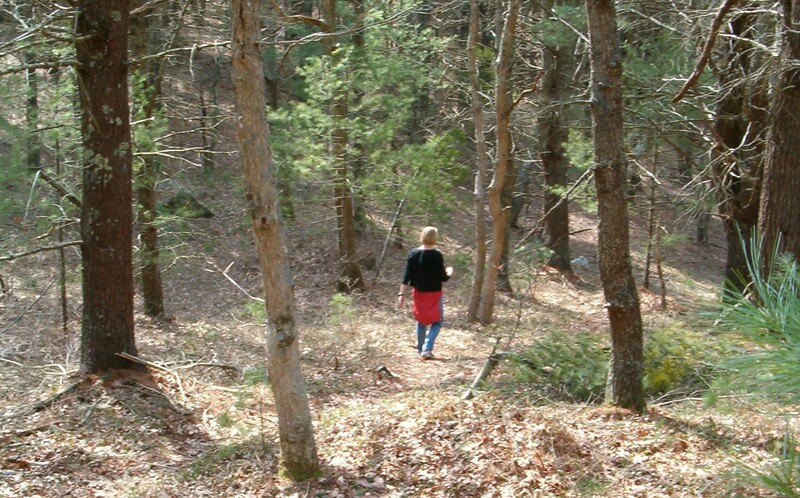 Follow the Moraine Trail south of Brick Kiln Road — look for the Falmouth Conservation Land sign at the edge of the woods — through the cathedral pines, a majestic grove of white pine, to the Town Forest and on to Long Pond. To head north along the moraine trail, into the Kettle Holes Area, access is just east of the intersection of Blacksmith Shop and Service Roads. Look for the white blazes that mark the trail, just off the edge of the road.